As is the long-standing (all of twice) tradition here at RandomC, we start a season with the simplest of all writer polls. That is, what was the best premiere of the season? This is first episodes of new series (or true sequels) only – no carryover and no cumulative impressions. And fittingly for spring, that season of renewal, an old flower long dormant has bloomed again to take the top spot just as the sakura are blooming across Japan. Me:Okay, loved the first one; should be interesting to note all of the changes =03. Me:Looks the same to me =02. Seriously though, as I said elsewhere, the original plays up the comedy a bit more, while the new anime plays up its drama more. Not a bad thing by any means, but I’m not quite feeling that the new anime is ‘better’ than the original, if only due to the tone of certain elements(like tone of voice, music choices). Not surprising, since, the comedic moments are aplenty in these starting episodes(which I feel orig does better so far) and those come off as… unfeeling… in the new one. I feel that when the story’s dramatic moments truly hit(no spoilers here) for certain characters, I think I’ll start to really see how poignant the manga really was, and the series will truly establish its own identity, even if the story continues on this 1-to-1 with the original anime’s plot. Is believing this one is better than the original a prerequisite to ranking it as the best of the season so far? I don’t think so. Given that I think the original is better than the manga and this one is pretty much bound to be more faithful, it’s probably a given that I’ll end up liking the new one less. Still plenty of room for liking it though (and yes, that’s my #1 vote). The real changes are going to come later, obviously, since that’s where Akitarou made some creative choices and of course, where the first series stopped. For now I would agree it’s a matter of tone, with the new one being a hair more serious and the old series a bit more irreverent. to be honest nothing in this season got me going all dokidoki. sure, nostalgia-ride with fruits are something(?) as i said, i’m still a fan of alien eyes tohru, but it’s not wow-material. i sure as guano hoped for tuesday and the tumblr ride to be fun, alas it was not, but i chuck that to my well-deserved hatr…uneasiness when anime is touched by western woke crowd, as in getting touched by a plague victim could be called uneasy, you catch my drift. prev season(s) though, goddamn youjo senki premiere made me just-so-happy. as an example. and by being x, did it not dissapoint. and it will not dissapoint if the anime gets season 2, cause the source is glorious. The Youjo Senki movie did fairly well at the boxoffice, with the official twitter account for the show proclaiming it grossed over 300 million yen by mid March. And by all accounts it looks like it continued with a decent pace into April. They also have any physical media sales to look forward too soooo.. Maybe they’ll give us a second season when they’ve counted up all the dosh the movie has grossed! yeah, was really happy the movie did good to be honest. which is why i preserve a modicum of hope to actually see season 2. and if it does drop, it would go into the more peculiar and turbulent parts of LNs. more yandere smiles for yandere gods! 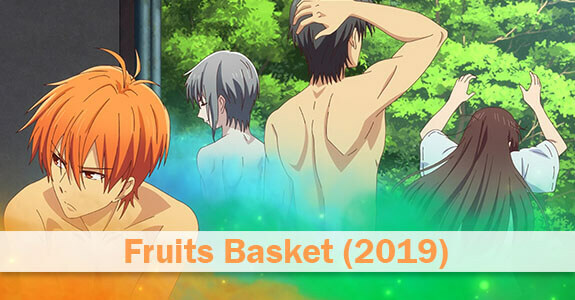 No surprise Fruits Basket is doing so well, it has the nostalgia factor going for it. That often fails to help. I think it has the Furuba factor going for it – plenty of reboots tank, both with critics and fans.